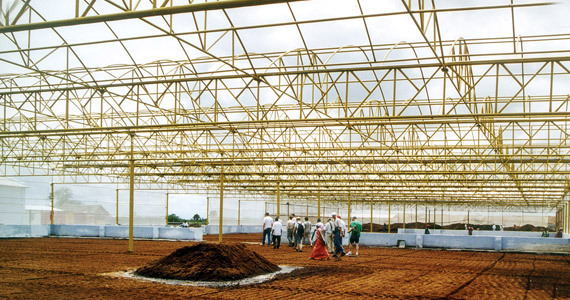 This resulted in huge crop damages especially in France and the Netherlands.In order to prevent delivery problems in times of high needs CANNA went overseas and made substantial investments in local infrastructure; concrete bunkers were built for controlled storage, mechanization took place and contracts were signed with selected farmers. The RHP Foundation (Quality Mark for Substrates) is a well known concept within the potting mix sector in the Netherlands for controlling substrates and raw materials. The inspection is not limited to the finished product but covers the sourcing and processing of raw materials all the way to the CANNA COCO 50 liter bag. The RHP quality mark has been included in the certification package of ECAS (European Certification body for the Agricultural Sector). ECAS monitors CANNA’s entire production from the factory in India to the end user, to ensure that all requirements for COCO substrate certification are satisfied. RHP products meet the highest chemical and physical demands and are free from weeds and pathogenic organisms. RHP standard can be met in two ways; either by steam sterilizing the COCO materials or by completely controlling the production process. A disadvantage of a steamsterilized product is its inability to naturally protect crops against harmful moulds, like Pythium. Steaming also converts plant usable Nitrate nitrogen to plant toxic Nitrite nitrogen. CANNA went the hard way and decided to refrain from steam sterilizing its COCO. Our buffering process allows us to ‘pre-program’ the media to a certain age. This ensures you get the same consistent, high quality material time after time. COCO is a 100% natural grow and flowering medium, which has proven its value across years and years. CANNA, the COCO pioneer from Holland, has played an important role in the current status of COCO in horticulture. COCO is not only a high quality product, but also an honest and environmentally friendly product. For many years the raw material was considered waste material, and enormously useless “COCO Mountains” appeared in the landscapes of countries like Sri Lanka and India. By developing a special biological composting process this “waste” was transformed into a high quality product. This innovation was, and still is, an important contributor to the local economy of India and Sri Lanka. This and the unique growth characteristics ensure CANNA COCO is the medium of the moment and the future! Apart from a better visual appearance the root development is easier and superior in COCO compared to the development on rockwool. “Due to a healthier root development a better growth is obtained and fewer problems occur. This results in a longer shelf time, as well as a better color and taste”, claims Hartman.